As your iPhone 4 questions continue to pour in, we turn our attention to issues related more to the iOS than the phone itself. How do I quit an app so it is not running anymore? Is the only way to force quit it from the multi-tasking bar? 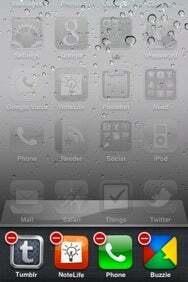 All the apps I use when running iOS4 are added to the multitasking window. Does that mean that they’re all “running” and that the only way to stop them from running is to delete them from the multitasking window? Or are they listed there even after I’ve closed them in case I want to “switch back fast” to them? Tapping that red quit badge will quit an app completely, removing it from the task dock. If an app in the task dock hasn’t yet been updated for iOS 4, it behaves just like an app in iPhone OS 3, requiring a full relaunch the next time you open it—even if you open it directly from the task dock. Does that muddle things enough? As for “fully” quitting apps that appear in the task dock, you can indeed do this, and the process is similar to what you would do to delete an app from your iPhone: With the task dock visible, tap-and-hold on any app icon until the apps in the task dock begin to jiggle. Tap an app’s tiny quit (-) badge to quit it completely and remove it from the task dock…until the next time you launch that app again. 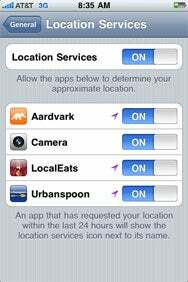 Want to prevent apps from using your location data? You can disable it in Settings, app by app. What’s the little angled arrow that sometimes appears at the top of the bar next to the battery? This indicates that an application is currently using your Location Services data—your geographical location based on a combination of the phone’s GPS, cellular, and Wi-Fi circuitry. If you want to prevent applications from using this data, there are several ways to do so. The most obvious is to decline an app’s request, at launch, to use your location. But you can also disable Location Services altogether, or just for particular apps, by navigating to Settings -> General -> Location Services.